The Wedo ECO series wick is a flat braid, coreless, cotton wick with thin paper filaments interwoven for burn stability. The specially treated paper threads provide a controlled curling of the wick making the ECO series self-trimming, which results in minimized mushrooming, soot and smoke. The ECO series wicks are all primed in a special 100% vegetable wax blend and were sized using soy wax. ECO wicks are particularly successful in lower melt-point vegetable and paraffin waxes. All ECO Series wicks are cut to 6" lengths and are tabbed using a 20mm round wick tab with a 6mm neck. *ECO series wicks are tested and sized in a container soy wax. 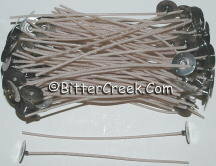 Wicks are based on the WIDEST area diameter of the jar you plan to use. This is typically not measured at the opening unless the container is perfectly straight up and down. ECO-4 Small 2 - 2.5"
ECO-6 Medium 2.5 - 2.75"
ECO-8 Medium 2.75 - 3"
ECO-10 Large 3 - 3.25"
ECO-12 Large 3.25 - 3.5"